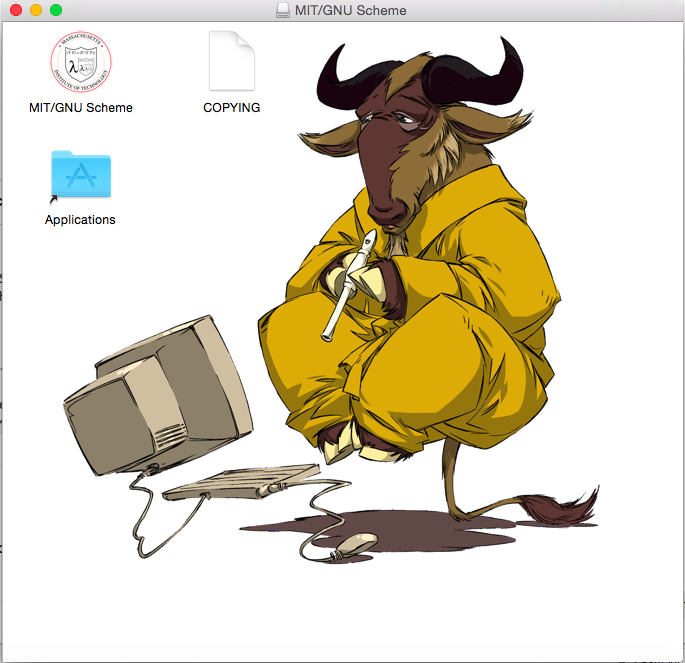 How to install MIT Scheme on Mac? 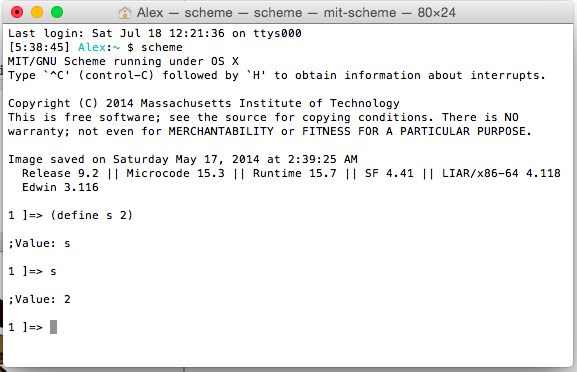 I want to install MIT Scheme on my Mac, I have downloaded the MacOS X binary(x86-64). However, I could not make it work using Mac Terminal. but it seems out of date and does not work. So, I'm looking for a simple method which allows me to write Scheme code using Mac Terminal. I have struggled for hours to try to install it. Download either the 32-bit or 64-bit dmg file for Scheme. Double click the .dmg file, and you'll get this window, in which you should drag the "MIT/GNU Scheme" file into the Applications folder. I found it easier when a maintained package manager such as homebrew covers all the dependency and build stuff. would do. X11 is now optional instead of dependence. There is still an --with-x11 option which requires whole Xcode. If you have the latest version of Mac system, El Capitan 10.11.2, You might need to do something different than above. Type scheme in the terminal to see if it works. If you get the following screenshot, that means you succeed it. You definitely need to put local there. The reason is this, Apple improved OS security in OSX 10.10 (rootless), and changes to the general system-wide binaries (such as /usr/bin) is not permitted. Same idea, of course, but this got me up and running when brew tap homebrew/x11 responded with multiple conflicts. As always, remember to brew update then try again when you are having problems, a la Homebrew's troubleshooting guide. will drop you right into a scheme REPL. Not the answer you're looking for? Browse other questions tagged macos scheme mit-scheme or ask your own question. How can I start up scheme in mac os(10.11.3)?